This is the tale I envisioned when I was photographing an ibis at sunset. He had long legs, an interesting shape and unique beak, making him the perfect candidate for a silhouette. He was entertaining to watch, and I enjoyed shooting as he walked back and forth, capturing him in a variety of poses. Photographs start out with a story in mind. 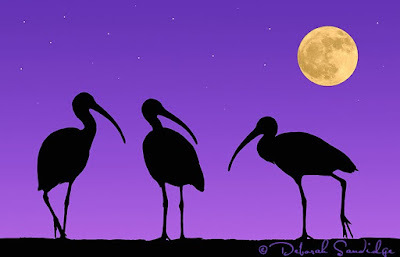 This is the one I wanted to tell with a trio of ibis, a purple sky, punctuated with stars and the moon.